The other day I was at Roche Brothers in the cheese section, when I spied a jar of jam. I was immediately intrigued, as my love of the raspberry-rose (and often lychee) combination is well-known. I experienced momentary confusion as to whether it was quince and apple jam (due to the brand name) or raspberry-rose jam, but determined that it was the latter and decided to try it. It’s really excellent– the raspberry is nice and bright, and the rose comes through just enough to avoid being overly floral. But what to do with it? It seemed a waste to spread it on toast, and I worried that the delicate flavor would be lost if I used it in a layer cake. But then I saw these lovely linzer cookies from Brina’s Bites and knew exactly what to do with it. Once we arrived home with our giant 5-lb bucket of blueberries, I was informed by my daughter that we would be making pudding. Blueberry pudding. With chocolate. I’d never really heard of a chocolate blueberry pudding before, but hey, we had five pounds of berries, we could afford to give it a shot. I decided to go really simple, with a basic cornstarch-thickened pudding poured over whole blueberries– I could’ve made an egg-yolk-thickened custard with real chocolate and a berry coulis, but we’re talking about a four-year-old here, she wasn’t going to appreciate the finer details and would probably prefer the basic dessert. I’m a sucker for pastry, especially at breakfast, so when I came across this recipe for King Arthur Flour’s Almond Puff Loaf, which promised a delicious, multi-layered pastry in only a few simple steps, I knew I’d have to try it out. It starts with a base that’s halfway between a biscuit and a pie crust, and it’s topped with choux paste to provide some serious puff. The process reminded me a little of the Gateau St. Honoré, but the finished product was very different– probably because of the different ingredient proportions. I also decided to add a layer of almond paste between the two doughs, to really amp up the almond flavor– I would highly recommend it to anyone seeking to try this recipe, along with using apricot jam, which pairs perfectly with the almond. 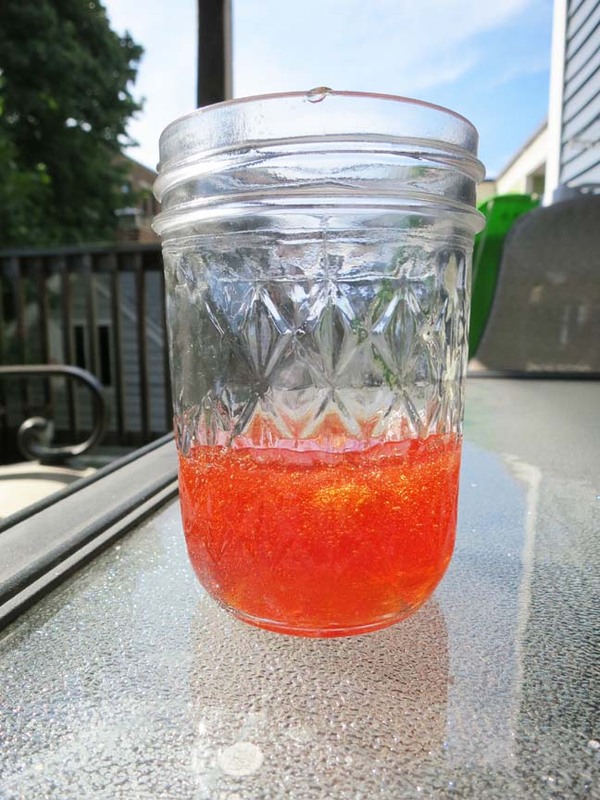 I’ve never actually made jelly before. Compote, yes. Curd, sure. Even jam, way back when I was a kid in my grandmother’s kitchen. But jelly? Never. When I was offered a bagful of tiny crabapples and told that they were “great for jelly,” though, I knew that fate was dropping the opportunity in my lap. I opened the bag and eyed the crabapples dubiously. They were so tiny (seriously, like cherry-sized)– wouldn’t it be a huge hassle to remove the seeds from each and every one? Happily, online recipes assured me that I wouldn’t need to do anything like that– simply cut the stem ends off and halve them. I’d only be draining the apples of juice anyway, not pureeing them or otherwise eating the solids. It actually sounded kind of fun! 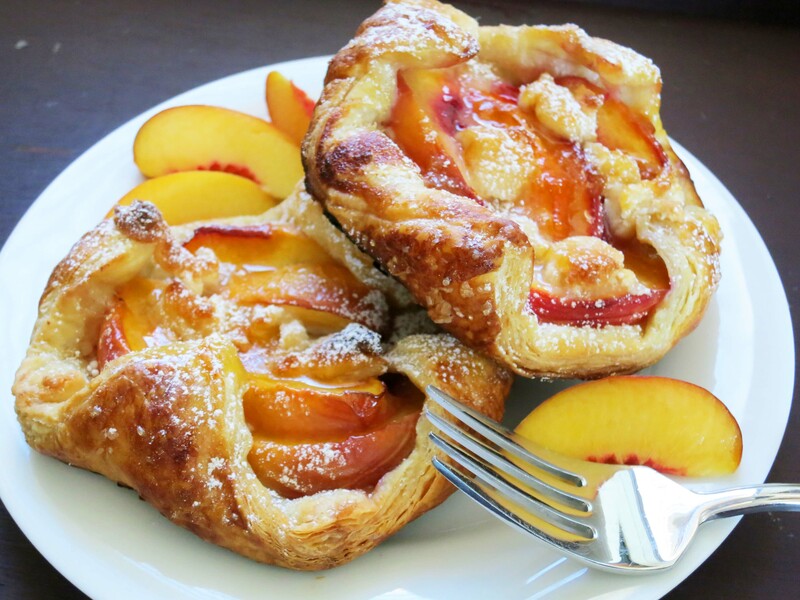 These pastries* were really a spur-of-the-moment creation, based on the availability of fresh peaches and a last-minute dinner invitation. You know me, I can never arrive at a gathering without some kind of baked good, so I skimmed my recipe box for inspiration and came up with these incredibly simple, yet incredibly tasty desserts. Squares of buttery puff pastry are topped with a pillow of marzipan and a handful of peach slices, then baked to crispy, flaky perfection. The tanginess of the peaches is set off nicely by the floral sweetness of the marzipan, and the crunch of puff pastry wraps it all together in a convenient bundle, ready for dessert or an indulgent breakfast treat. *Okay, so these aren’t really danishes– a danish is a very specific type of pastry with a very specific type of laminated, yeasted dough. Puff pastry was a shortcut.